The vPC aka virtual Port Channel is a Cisco technology that presents both Nexus paired devices as a unique Layer 2 logical node to a third device. The third device can be a switch, server, or any other networking device that supports link aggregation technology. From a spanning tree standpoint, vPC eliminates STP blocked ports and uses all available uplink bandwidth. Spanning-Tree is used as a fail safe mechanism and does not dictate L2 path for vPC attached devices. vPC: The combined port-channel between the vPC peers and the downstream device. vPC peer device: A vPC switch (one Nexus device). vPC domain: Domain containing the 2 peer devices. Note: Only 2 peer devices max can be part of same vPC domain. vPC peer-link: Link used to synchronize the state between vPC peer devices. vPC peer-keepalive link: The keepalive link between vPC peer devices; this link is used to monitor the liveness of the peer device. vPC member port: One of a set of ports that form a vPC. Orphan port: A port that belong to a single attached device. Create a vPC peer link. The vPC feature must be enabled before it can be configured. Define a VPC domain and the peer-keepalive link; by default, vPC peer-keepalive is placed in VRF management. My suggestion is to define the role priority statically: the switch with lower role priority will be elected as the vPC primary switch. In the “Failure scenarios” paragraph (at the end of this article), you will understand how this feature works. Note: There are several vPC features like “auto-recovery”, “ip arp syncronyze”, “peer-gateway”… check on cisco.com. 3. Create a vPC peer link. These commands are the same on Ciscozine1 and Ciscozine2. Note: vPC peer-link is a L2 trunk carrying vPC VLAN and it must be a 10-Gigabit Ethernet link. Remember: The vPC peer-link is always in forwarding state (due to its function)! Below the spanning tree state of the peer link (port-channel1). 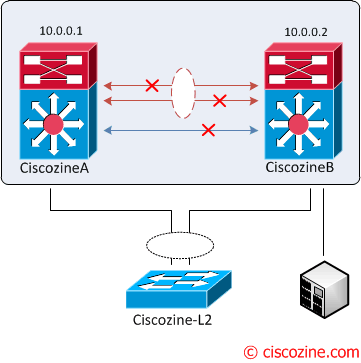 Configure a “traditional” port-channel adding the “vpc number” sub-command. 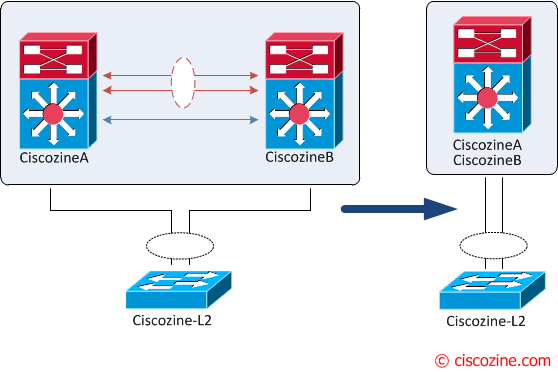 Again, these commands are the same on Ciscozine1 and Ciscozine2 devices. Remember: The vPC number does not need to match the PortChannel number, but it must match the number of the vPC peer switch for that vPC bundle. show vpc: Displays brief information about the vPCs. show vpc orphan-port: Display all orphan-ports. show vpc consistency-parameter interface port-channel ‘x’: Displays the status of those parameters that must be consistent across a Port-Channel. STP MST Region Name         1     ""                     ""
Type 1 – Puts peer device or interface into a suspended state to prevent invalid packet forwarding behavior. With vPC Graceful Consistency check, suspension occurs only on the secondary peer device. Type 2 – Peer device or Interface still forward traffic. However they are subject to undesired packet forwarding behavior. Note: Type 1 and Type 2 consistency check apply both for global configuration and for vPC interface configuration. 1. vPC peer keepalive link fault: During a vPC peer keepalive link failure there is no impact on traffic flow; in fact, the vPC peer link is operational. 2. “partial” vPC peer link fault: Nothing happens, because the peer link is up. 3. vPC peer link fault: Based on the configured role priority for the switch, only the secondary peer device (higher priority) shuts its vPC member ports to down state and in addition shuts all its vPC VLAN interface. 4. vPC keepalive link failure followed by a peer link failure: A dual active scenario occours; vPC primary switch continues to be primary but the vPC secondary switch becomes the operational primary switch and keeps its vPC member ports up. There is no loss of traffic for existing flows but new flows can be effected as the peer link is not available, the two vPC switches cannot synchronize the unicast MAC address and the IGMP groups. Remember: If orphan ports are connected to vPC secondary peer device, they become isolated. Note: vPC is similar but not identical to Cisco Virtual Switching System (VSS); in fact, the main two differences are: vPC works with NX-OS and each Nexus devices has the control-plane active, while VSS works with IOS and only one device has the control-plane active. Why use HSRP version 2?